Feiqin Liu is a PhD student in Environmental and Resource Protection Law at the China University of Political Science and Law. She participated in the project of “Assessment of the enforcement of the new Environmental Protection Law”. She also co-authored the “Report on the Assessment of the Enforcement of the new Environmental Protection Law”, which was published by the China University of Political Science and Law Press in July 2016. Moreover, she published “Effect of measures of ‘Regional Restriction on Environmental Impact Assessment Approvals’ and ‘property impounding’” in Social Sciences in Chinese Higher Education Institutions (4th period 2016). She was also part of the major project “Research on the Relationship between Fishery Resource and Ecological Protection Schemes & Related Regulations”, which was based around the revision of the “Fisheries Law” and commissioned by the Bureau of Fisheries in the Ministry of Agriculture. In particular, she was in charge of the research on core topics, report composing, management and coordination. On 1 January 2015, China’s amended Environmental Protection Law came into effect after more than 25 years without revision. China Water Risk previously interviewed Professor Wang Canfa from the University of Political Science and Law in Beijing, who thought the law marked a new era of environmental legislation in China. 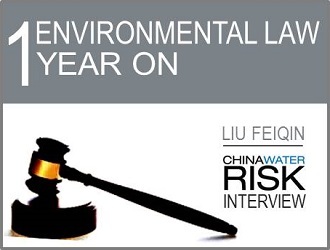 Over a year on, we sat down with Liu Feiqing, PhD student in Environmental and Resource Protection Law at the China University of Political Science and Law, to get her views on the amended law’s impacts to date and what we can expect from it going forward. China Water Risk (CWR): The Amended Environmental Protection Law has been in force for over a year and a half now. What impacts or changes have you seen? Are there any significant instances? Companies’ operations tend to be more standardised, and the awareness of the need to comply with environmental laws has improved. Among these effects, the removal of “local crude policies” has had some of the most obvious effects. For a long period of time, some departments and local governments have set certain policies to simply increase GDP. These go against national laws and policies on environmental protection, proving obstacles to the enforcement of environmental laws. According to the requirements of the “Notice of the General Office of the State Council on Strengthening Environmental Supervision and Law Enforcement” (Nov 2014), the relevant departments of the State Council and local governments started to remove these “local crude policies”. By October 2015, 45 regulations or documents had been removed by such departments and another 206 cleared by local governments. In 2015, the Ministry of Environmental Protection (MEP) sat down with officials in charge from 16 prefectural level cities and 2 counties. Many provincial environmental protection bureaus were also interviewed. In total, 163 cities were comprehensively investigated, 31 cities were interviewed, 20 cities or counties were measured against the “Regional Restriction on Environmental Impact Assessment Approvals”. 176 issues were identified, published and supervised. The enforcement of such measures has not only improved environmental protection of the interviewed and supervised cities (counties or districts), but has also served as a warning for other officials. According to the media, a series of outstanding problems were solved and environmental conditions improved after those interviews. CWR: Enforcement can be an issue. How effectively has the Amended Law has been enforced? Have fines been well enforced and high enough? LFQ: Since the amended EPL was enforced, the solid work and strict enforcement of the MEP and local governments have made breakthroughs in enforcement, especially in some key environmental regulations, e.g. information disclosure, environmental protection supervision, property impounding, daily fines (after missed compliance deadline), etc. Reduced illegal pollutant discharge, thus contributing to the improvement of China’s overall environmental Quality. Crucial to environmental protection is the control of wastewater discharge and exhaust gas emission. Within our sample companies, those that discharged wastewater or emitted exhaust gas have much fewer violations in 2015 compared with 2014. Here we can see the effect of “the strictest EPL ever”. However, in addition to strict punishment for violators, it’s also necessary to encourage the implementation of sustainable technologies, build a new concept of sustainable development, improve awareness of environmental protection, and ultimately create a new operating model that includes environmental protection. CWR: The Ministry of Environmental Protection is tasked with safeguarding the environment but this has historically been difficult with its limited power. Has this changed with the amended law? LFQ: The amended EPL provides greater enforcement power and approaches to environmental protection authorities through various means, such as property impounding, daily fines (after missed compliance deadline) and administrative detention. Most of these means directly impact the economic interests of polluters, increase violation costs and play an important role in cracking down on violations and environmental protection. On 22 September 2016, the general office of the Central Committee and the general office of the State Council jointly issued the “Guiding Opinions on the Pilot Work of the Reform of the Vertical Management of the Environmental Protection Authorities for Areas under Provincial Level”, indicating the start of deep reform involving environmental protection authorities. This Guiding Opinion changes the power scheme for such locations, which should prevent local interests from proving obstacles to environmental protection. As the pilot work goes on, the power and the enforcement of the environmental protection authorities will definitely be enhanced. CWR: Is there now more cross departmental communication and action? LFQ: Inter-governmental collaboration has always been complex, and the work of one department needs the help and cooperation from other departments. Inter-governmental communication and collaboration have improved since the amended EPL was enforced. In March 2016, the general office of the government of Beijing issued 5 responsibility lists including the “Responsibility List of Atmospheric Pollution Prevention”. Each of these lists involves different departments such as Environmental Protection Bureau, Industrial and Commercial Bureau, Bureau of City Administration and Law Enforcement, Bureau of Quality and Technical Supervision and Planning Committee. This can be regarded as a good example of the inter-governmental communication and collaboration. CWR: The 3 Pollution Action “Ten” Plans (Air, Water & Soil) are all out now and set clear actions for each department. How do these align with the EPL? LFQ: The gist of the three action plans agrees with the amended EPL, sharing similar principles like “priority of environmental protection”, “prevention oriented”, “comprehensive control”, “public participation” and “damage responsibility”. The amended EPL is the basic law in pollution control and ecological protection, stipulating the basic principles, schemes and approaches needed. The three action plans have different focuses respectively and provide detailed and specific actions and measures for the pollution control for water, soil and air. CWR: Do you have any thoughts on the revision of the Water Pollution Prevention & Control Law currently under the public consultation phase? LFQ: On 12 June 2016, the MEP issued the “Water Pollution Prevention and Control Law (Draft Revision)” Consultation Paper and its instruction. This is the first time that the “Water Pollution Prevention and Control Law” was amended significantly since it was enforced eight years ago. The main aspects of this amendment are: strengthen the management of water quality targets, enhance control of water pollution sources, coordinate water pollution prevention and control schemes, implement responsibilities, and comprehensively apply different measures. This amendment succeeds the previous water pollution prevention and control law and incorporates the highlights of regulations like the amended EPL and “Water Ten”. Additionally, this amendment means that local governments can set up their own standards (at least meet national levels or stricter) for water pollutant discharge according to local conditions. It also indicates stricter supervision for industrial polluters, adds water pollution prevention regulations for rural areas and strengthens the punishment for violations. However, the specific rules of this amendment and issues about the connection between different schemes remain to be improved and perfected. CWR: Going back to the Amended Law, have there been any advances on the Ecological Compensation System (ECS)? LFQ: Environmental problems are external, the Ecological Compensation System (ECS) works to internalise environmental protection, with payment from the beneficiaries. In general, China’s ECS is still limited and is at a relatively low standard. Plus, the scheme for communication between protectors and beneficiaries still needs to be perfected. The amended EPL stipulates for the first time that China shall formally establish and improve the ECS, clarifying the legal status of the ECS. It mentions two types of ECS: National financing and coordination or market mechanisms by local governments. The “Opinions of the General Office of the State Council on Improving the Compensation Mechanism for Ecological Protection” issued on 13 May 2016 supports the amended EPL regarding the ECS. It states a target to establish an ECS by 2020 with the principle of “who benefits, who pays”. However, there is still a long way to go for the establishment of such an ECS. Problems such as the source of compensation funds, claim standards and claim process remain to be solved by further legislation. CWR: Has the “polluter pays” principle been improved upon? Is the government still covering for most of the environmental damages? LFQ: The “polluter pays” principle includes three aspects: pollutant discharge fee, recovery cost remediating the pollution and compensation for the pollution. It is generally believed by scholars that this principle has limitations. The amended EPL does not adopt the “polluter pays” principle instead the “damage responsibility” principle has been adopted. This principle is significantly more encompassing than the “polluters pay” principle as it is applicable to anyone that causes damage (not just pollution) to the environment – “those who cause damage to the environment or ecology shall bear the corresponding tort responsibility, administrative responsibility and criminal responsibility”. On 21 January 2016, the environmental protection public interest litigation in Taizhou, Jiangsu Province was just settled and the court finally supported the claim of RMB160 million, a “sky high” amount. According to our statistics, in 2015, there were 2079 cases of “transfer to administrative detention”, 1685 cases of “suspected environmental crime” (excluding data from February to June in Shandong). All these reflect that the principle of “damage responsibility” is been executed. On 29 August 2016, the “Drafts of Environmental Protection Tax Law” was presented to the National People’s Congress Standing Committee for review, proposing the collection of the environmental protection tax. This legislation aims to transfer the pollutant discharge fees to environmental protection tax, according to the “tax shift” principle. CWR: What are the main challenges concerning the Environmental Law at this point? Limited capabilities and methods for public participation. CWR: Can we expect increasing impact, with the environment being prioritised, with the amended EPL? LFQ: The amended EPL enforced in 2015 has already shown its role in promoting and protecting the environment whilst also successfully punishing violators. With the amended EPL being further enforced and promoted and the implementation of related regulations, we can expect more positive transitions. These will likely include enhanced information disclosure and various approaches for increased public participation. Moreover, as the reform of the vertical management of the local enforcement is promoted continuously, environmental enforcement will be stricter and more powerful. With more environmental public interest litigations, environmental justice will play a more important role. In sum, as the environmental enforcement scheme is continuously perfected, the rule of environmental laws will be more and more important in the management of environmental protection.